My memories of the 1990 World Cup are scattered at best and, like most of the rest of the world, predictable at worst. Oh how we’ve tried – and failed – to forget that the games themselves were dire, for the most part, with the tournament saved by all the extras: Gazza’s tears, Valderrama’s hair, Toto Schillaci’s bug-eyed goal celebrations, and Andreas Brehme’s goal in the semi-final courtesy of Paul Parker’s arse. 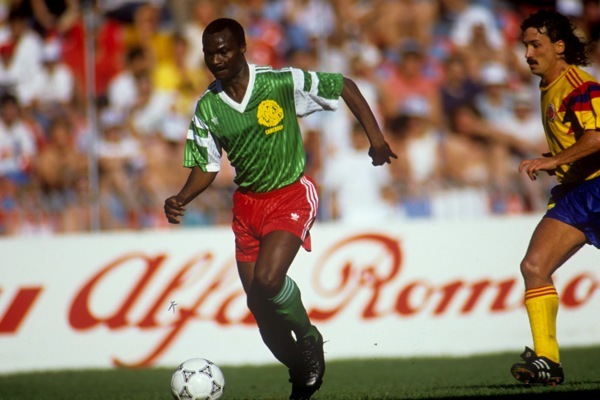 As an eight-year-old huddled in front of the TV for my first World Cup, those silly recollections prevail, but some two decades on, another memory stands out: the downright perfect shirt sported by the Indomitable Lions of Cameroon. It begins and ends with the lion that roars in raised yellow felt across the heart, the one that inspired Roger Milla to pick Rene Higuita’s pocket, score goals off the bench, and dance at corner-flags. This lovingly drawn animal gave Andre Kana-Biyik and Benjamin Massing the feral intensity to maul Argentina in that famous 1-0 tournament opening shock win, setting the stage for strong tournament run. 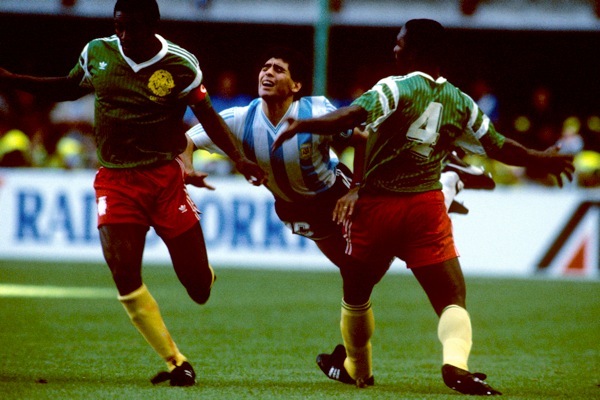 They weren’t just ordinary tackles, either; Massing’s lunge on Claudio Caniggia was borderline criminal, and yet the Argies would emerge from the tournament with a deservedly worse reputation. With the lion set against the subtle two-tone stripe of the jungle green, Cameroon struck fear in the hearts of Lineker and co. in that quarter-final, and though the Three Lions were ultimately too strong, that kit catalysed Cameroon’s best-ever World Cup run. It looked even more perfect when matched with the red shorts and yellow socks, a bold and unapologetic display of national colours in an era of rudimentary design schemes akin to the 4-4-2 formation. In shirt/shorts combos more inspired by aerodynamics than design, the Lions have mustered nary a meow in international competition since. When you look at this 1990 kit compared to recent, watered-down incarnations, it’s not hard to see why. Great shirt, always liked the keeper top that went with it too, black, pink and green if I remember correctly. I actually own those shorts. They leave little to the imagination, however.